Having a unique watch is very important. Watches are a big deal in people's lives and having one that stands out and gets you compliments is always nice. Wood watches are a great way to do that and JORD has just what you need. Such a beautiful watch and so unique! This watch is so lightweight i's ridiculous. My husband has a watch addiction (he has over 20) and this has quickly become one of his favorites because it's so lightweight. It will be really nice for summer since it will allow his wrist to breathe. My husband has gotten so many compliments on this watch. It has a nice face with a hardened scratch proof glass. I's 33mm in diameter and has a god size to it. It features a single action locking clasp that is stainless steel. It also has a 3 hand Citizen Miyota Quarz Movement. My husband's favorite watches are Citizen (they're affordable, but still very classy) so that is part of why he loves this one so much! The watches all come with plenty of links. My husband's wrist is around a 9" and this watch fits him perfectly, but they an also send extra links if you need them too and it's easy to pull out links as well if you have a smaller wrist. I really like that they are unisex watches too. Perfect for men, women and even teens. They have quite a few different kinds of watches and each one comes in different colors. Price: $139 which I think is WONDERFUL!! My husband LOVES watches. He truly admires the quality and craftsmanship that goes into making one. I'd choose the 746 series in black for him. 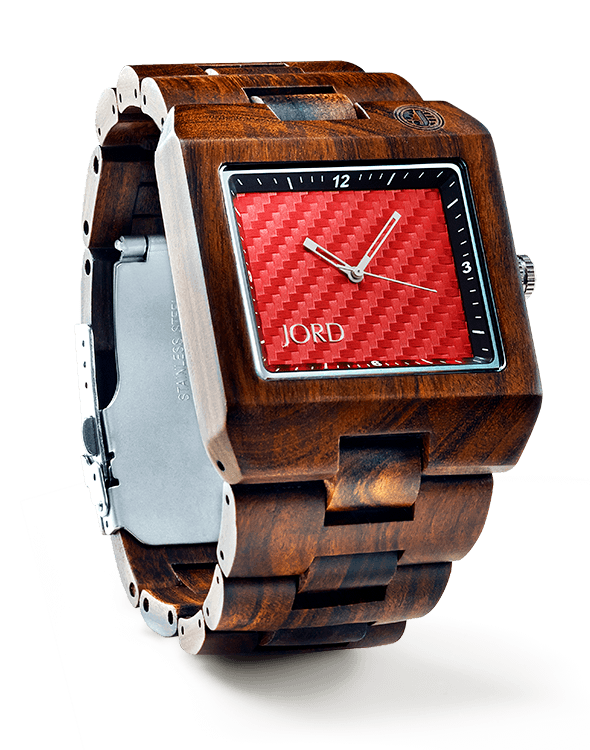 After much consideration, I am choosing the Jord wood watch in this style-746 In Cherry and Black! I would choose either the Sully in Cherry for my daughter or the Delmar in blue for hubby. I would choose the Delmar in blue for my husband. If I won, I would choose the Sully in Cherry and Maple. I really like the 94A watch in Chocolate. It would make an amazing gift for my husband! I would love to get the 746 SERIES Black & Maple watch. I'd love the 746 in black! I'd like to get the 746 in Maple. These are such unique watches. I would like the Delmar for my husband. I think my son would really like the Delmar Watch in Blue. I would select the series 746 in black. I love that you can see the mechanics of this watch. I love the sully in cherry! I'd love the Black and Maple Sully watch! My favorite #JordWatch is the Ely Series Watch in the Cherry Color. I would love to have one. I would choose the Ely on cherry for myself. Very pretty and simple. I like how slim it is. I like the Ely natural green and maple. I would choose the sully watch in cherry. These are all beautiful watches and would look sharp on anyone. I really love the Fieldcrest in natural green, although I would be more than happy to own any Jord watch. I would choose the Sully watch in cherry & maple for my hubby; I think he'd really like it. I like the sully series in cherry , fingers crossed !!! I would choose the Delmar Series Red!